Mid America Motorworks helps vintage VW owners restore their classic cars with high quality classic VW parts for the older Air-Cooled vehicles including the classic Volkswagen parts for the Beetle, SuperBeetle, Bus, Vanagon and Karmann Ghia. 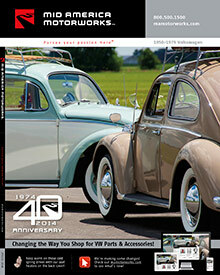 Classic VW Parts - Whether you're shopping for VW engine kits, batteries and ignition systems for your Volkswagen Beetle or performance parts, alternators, generators and suspension parts for your Ghia, Mid America Motorworks features the parts you need no matter what your restoration entails. Interior parts - Keep your classic VW looking its best on the inside as well as the outside with parts and accessories for your interior including steering wheels, dashboard and console parts, seatbelts, seat covers, sun visors, carpet and floor mats and more interior parts and accessories for your Bus, Vanagon, Beetle, SuperBeetle or Ghia. Body parts - Give your VW an extreme body makeover with body hardware, hoods, bumpers and fenders, door panels, wheels and tires, rearview mirrors, wiper blades, emblems, moldings and other classic parts that will keep your Volkswagen exterior looking like new. Apparel & Accessories - You've scored all of your Beetle parts, now show off every ounce of pride with officially licensed VW clothing and accessories - from bright and colorful apparel to themed license plates and backpacks, apparel for men and women, VW caps and hats, Volkswagen books and manuals, themed jewelry, home and office accessories and more. From brakes to exhaust systems, stock mufflers to oil and fuel parts, Mid America has a high performance stock of classic VW parts that will help you restore your VW back to the fine vehicle it once was.